The stuff of the future brought to us on the wings of the past—Milkweed seed floss? It has been apparent to me for some time that in order to survive as a species we must reshape our economy into a plant-based economy. This will gradually be accomplished by teaching urban citizens the healthy value and fun of growing some of the food they eat. Groups of citizen organizations such as Loving Garland Green, and individuals from the community sharing their knowledge and local urban agriculture experiences with their neighbors are advancing this transition. I am not the first author to call attention to the finite aspects of our oil-based economy as evidenced by reams of literature on the topic. James Howard Kunstler is perhaps one of the most outspoken social critics of our oil-based economy. Unfortunately, much information on this topic follows in the vein of angry doomsday themes. It’s time to focus on the solutions that urban agriculture and local agriculture offer communities. Over the past couple of months I’ve been doing a lot of research on Monarch butterflies and their habitats. Milkweed is central to Monarch survival, as the Monarch butterfly will only deposit eggs on milkweed leaves. Thus, some of my research has led me into the “weeds” –milkweeds that is. 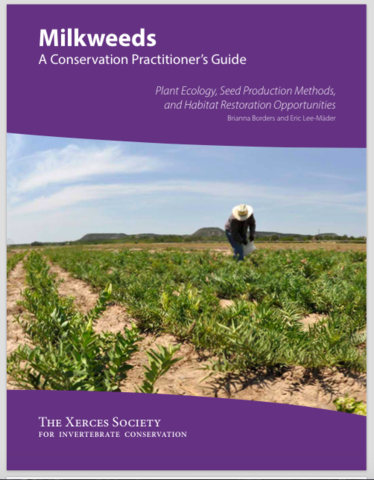 Just yesterday I discovered a wonderful text: “Milkweeds – A Conservation Practitioner’s Guide.” This156-page document is available for free download from The Xerces Society for Invertebrate Conservation. This society, established in 1971, is a nonprofit organization that protects wildlife through the conservation of invertebrates and their habitat. To download a pdf of the report, click here. In reading the text, I came across a section titled “Ethnobotanical, Industrial and Commercial Uses.” This information reminded me once again of the potential that a return to a plant-based economy offers the USA and indeed the world. Historically milkweeds have been used as a source of fiber, medicine, food, insulating material, and for the manufacture of flotation devices. Milkweed is a host plant for Monarchs and more! During World War II, more than 2 million pounds of milkweed seed floss were used to fill life preservers. In 1943, the federal government established a milkweed processing plant in Petoskey, Michigan. To acquire the needed raw material, massive pod collections were organized. These efforts involved farm organizations; youth clubs and even school children. Twenty-five million pounds of milkweed pods from 26 states were shipped to Michigan. As recently as 2011 scientists have been evaluating milkweeds as a potential substitute for crude petroleum. Milkweed latex is also being investigated as a possible source for rubber. Ogallala Comfort Company uses milkweed floss as a hypoallergenic filling for pillows and comforters. Prior to the US Entry into World War II, we were a plant-based economy. Petroleum-based plastics were in their infancy in the late 1930’s, early 1940’s. People sometimes forget that the USA and indeed the world were solidly a plant-based economy prior to 1941 and the entry of the USA into World War II. Henry Ford loved farmers and wanted to help them during the Great Depression. He believed that bio-plastic cars would help the struggling agricultural industry. 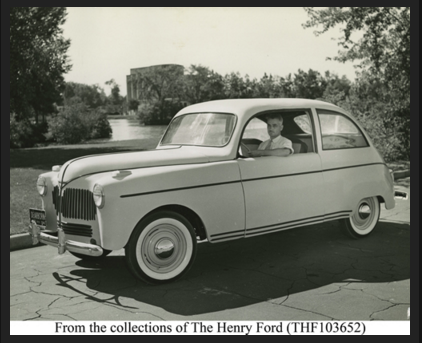 Thus, in 1941, Ford created a prototype car made from plant fibers such as wheat, soybeans, corn and hemp. This little car was so tough that its promotion invited people to try to dent it with sledgehammers. Note: Although those promoting hemp (not a bad idea) have sites all over the Internet claiming this car is made entirely of hemp—this is not true. However that does not detract from the value and potential that bio-plastics offered then and now (in spite of Dupont)—and also the fact this innovative design did include hemp fibers. 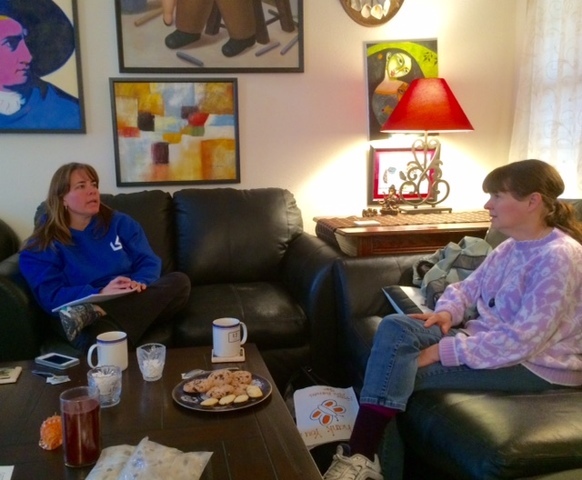 Jennifer Clements and Kala King discuss possibilities for mutually beneficial collaboration among teachers, residents and Garland public school students. Things don't always turn out the way we plan and this is not always a bad thing. About three months ago I declared my intention to get a group of Garland folks together to create a makerspace here in Garland beginning in January. I think that's what I did today, even if it was "by accident". I realize that maybe we already have makerspaces all over our community. We just are not using them yet to the full advantage of the people in our community. Collectively these places are known as our Garland ISD. For those who may not know, a makerspace (sometimes called a "hacker space') is a community-operated workspace where people with common interests can meet, socialize and collaborate. To quote from an article about the Dallas Makerspace that I wrote in July: "A Makerspace is many things. It is a place where art and creativity meet and blend with science. It is a place where the American local economy is being rebuilt one creative entrepreneur at a time. It is a place for dreamers and builders of all ages. It is a place for families and singles. People interested in Makerspaces (judging from the crowd of about 25 people on the tour I took of the Dallas Makerspace last summer) represent a melting pot range of ages, colors and cultures." Makerspaces are places that make tools and expertise available to creators, artists and inventors who might have the vision and the concept but lack the technical expertise (and/or the money for the tools) to bring the vision to fruition. With the Magic of Monarchs, Watson Tech Is Evolving into a Makerspace. Today I invited Jennifer Clements, a teacher at Watson Tech, one of our magnet schools here in Garland along with Kala King a talented nature photographer and Monarch rescuer to my home. Both Jennifer and Kala are Garland residents. I had several reasons for this meeting: 1) I wanted to secure use of some unused space in the Watson Tech greenhouse for Loving Garland Green to plant seedlings. 2) I wanted to introduce Kala to Jennifer because I was hoping that Kala might be able to photograph some of the experiments with milkweeds and monarch and also Loving Garland Green's installation of the very special butterfly garden. 3) I was hoping to learn more regarding the milkweed/Monarch experiment that is being undertaken at Watson Tech this spring and 4) I wanted to present and discuss the installation of a very special butterfly garden at Watson Tech. It's interesting how some things and people connect--like magnetic atoms. Dr. Watson from Midwestern University in Wichita Falls, Texas is directing this study with monarchs and milkweed at Watson Tech. ("Watson Tech" is no relation to Dr. Watson although Dr. Watson does have a son who attends Watson Tech.) The project mentioned is being undertaken by one of his graduate students at Watson Tech under his direction. Dr. Watson is a herpetologist. Kala King is very interested in reptiles and has even had pets such as pythons. At one point in her life she considered studying to be a herpetologist. During our discussions today, Kala mentioned that she wanted to make a poster using her fabulous nature close-up of the Monarch's life cycle. Turns out that Watson Tech has a new poster making machine. Kala will design the poster and provide the photographs and Jennifer will use the technology to make two posters: One for Watson Tech and one for Kala. Scholastic Magazines (Remember The Weekly Reader?) has expressed an interest in Kala's nature photography. If they purchase her nature posters, Kala would share some of the proceeds with Garland ISD. Loving Garland Green and the students at Watson Tech are not left out of these connections and benefits either. Loving Garland Green will get to test the first combination of a straw bale/hugelkultur garden bed design. We think this design will be especially beneficial for areas prone to drought. The students at Watson Tech will get to help us build and monitor this garden. They will also work with Dr. Watson and his graduate student on the milkweed/Monarch experiment. In all this the students get first hand experience and knowledge of what it means to innovate and invent--by doing it themselves and by working beside experts and also ordinary people (members of Loving Garland Green) who are putting their ideas into action. Get Ready to Grow Some Milkweed Folks! "A rescued butterfly in the hand may be worth two caterpillars in the bush" - The male Monarch above was released in early November here in Garland, Texas. According to most statistics, 96% of all rescued monarchs make it to adulthood while less than 5% of those in the wild survive to adulthood. I am working with a teacher from Watson Technology Center here in Garland to create a butterfly habitat with their students at the school. This proposed butterfly garden will be a unique design, especially suited for our drought-prone area: a combined straw bale/hugelkultur design. This design we believe would be suitable for a vegetable garden as well. Installation is scheduled to begin in late February. If you would like to read more about this type of garden and also check out some resources for milkweed, just visit the homepage for Loving Garland Green.org. Building a Monarch WayStation . Our Mayor, Douglas Athas, has taken the Mayors' Monarch Pledge and Loving Garland Green is supporting the Mayors office in encouraging Garland residents to plant milkweed. We have flower gardens all over Garland. Most of them are missing only one main ingredient to become a butterfly habitat for Monarchs: milkweed plants. In terms of planting and growing milkweed, there are just about as many opinions as there are experts. 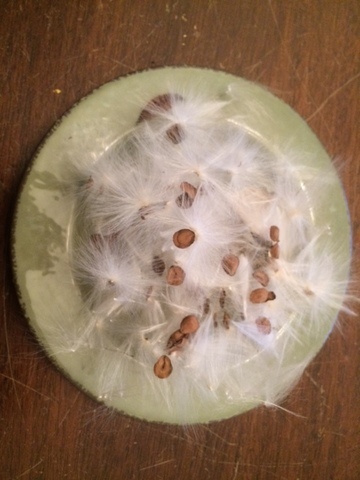 We plan to try several different methods for planting milkweed, including obtaining some plugs. Here is one process from the Native American Seed folks that we plan to follow. In addition to following this method, we will also try simply soaking the seed overnight and planting it--in a pot and in the garden soil. According to the experts at Native American Seed, most Native Milkweed plants do not do well in containers because of their long tap root. One of their experts recommends the following process. Sterile rubber (latex) gloves should be worn at all times containers and implements should also be sterile. Otherwise, mold can grow in the vermiculite and damage the seeds. 3. Moisten vermiculite with distilled water--moist but not dripping is best. In the DFW area food can be grown year round! Meet Carolina, Aaron and Dale--All members of the Garland Good Samaritan Volunteer Force. They are holding some fresh greens from the Garland Community Garden that I delivered this morning. This morning as I was cutting greens, cabbage, turnips, and broccoli down at the Garland Community Garden, I was reminded of the bountiful potential that our area offers its residents for growing food year round. If you plant the right things, you can grow great food all year long here in our area--even without a greenhouse and even in our urban setting. 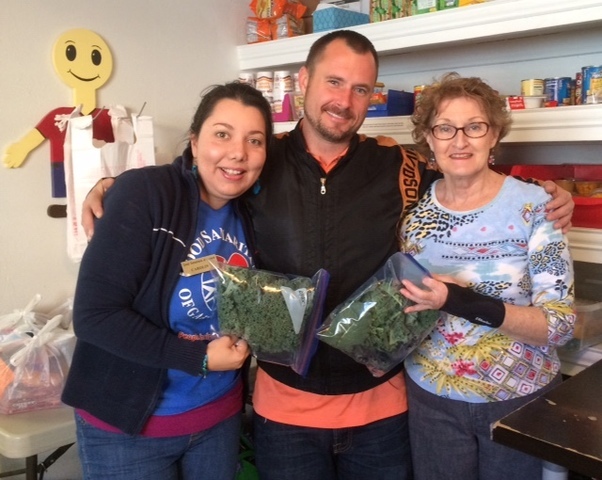 This morning I delivered 22 one-gallon bags of vitamin-packed healthy greens to the Good Samaritans of Garland. These greens came from the Garland Community Garden, six bags from Margie and Gene Rodger's (founding members of Loving Garland Green), and two from my garden. And speaking of the Good Samaritans of Garland, I had the honor to meet more of their volunteers this morning. Dale is a member of our retiree community. I asked her why she volunteers. She told me that she made a pact with God. If he would make sure that she was able to live on her retirement income that she would volunteer. Dales volunteers three days a week. Carolina is an immigrant from Venezuela who has only been in the USA for a year. She said she loves to volunteer and she is learning English through her volunteer work. Aaron, a young man full of positive energy, said he loves the feeling of helping others. Volunteerism is the bedrock of any community. And as many point out, when you volunteer, all sorts of good things happen: for your community, for the people you assist, and not least of all--YOU. Yes, most volunteers will tell you if you ask: We get more back than we give. It just seems to work out that way. Try it and you'll see what I mean. Whether purchasing a car, Internet connectivity, mobile phone service or healthcare-- most consumers are presented with a script that would bedazzle and confuse even the fast-talking con-artists hanging around the side-shows of rag-tag carnivals from the past century. You can never get exactly what you want and sometimes you don't even purchase the services or product you thought you did. We never get the same story from a different sales representatives--even though they are employed by the same corporation. Perhaps we never get the same story because we never talk to the same person twice. I sometimes wonder if they don't set their process up this way intentionally as part of a purposeful obfuscation strategy. Perhaps every other employee gets a different training manual. Who knows why this happens--but it does and consistently. Such was my experience two years ago when I purchased a healthcare policy from United Healthcare. At the time I told the customer service representative that all I cared about was a policy that would cover the 20% of hospital costs that Medicare does not cover when one must spend time in the hospital. I've heard quite enough horror stories about people going into a hospital, only staying a week, and then being presented with a $80,000 to $100,000 bill for the 20% part not covered by medicare. The customer representative was telling me about all the various healthcare "products" offered by United Healthcare. In the name of simplicity, I stopped her mid-stream. "Look", I said. "All I want is the cheapest policy you have that will guarantee to pay the 20% that Medicare does not pay should I be hospitalized." That should be simple and direct enough. Right? "Fine" I said, thinking that I had communicated and been heard. I paid $148.00 a month for two years--no that's not quite right. The truth is that United Healthcare began by withdrawing in auto-payments $148 a month from my bank account. However, by December of 2015, I noticed these automatic payments had crept up to $157.36 a month--almost $10 more a month. I have no recollection of giving them permission to do that. In fact, I'm fairly certain I never did. Where are the laws that are supposed to be written by the people I send to Congress to protect me from such fraud? I guess they are too busy managing their own personal fortunes to bother with people on Main Street. Also, please keep in mind that I never went to see a doctor during this particular time period as I had my checkups all with Medicare just prior to signing up with United Healthcare. In other words, all they did was take my money for two years--about $3, 552 not counting the $10 a month hike--All profit for United Healthcare. Add onto that another $2,400 for Medicare and in 2014 and 2015 I gave away a total of almost $6,000 to a multibillion dollar corporation and the US government. I mentioned to a friend in November that I had this healthcare insurance that covered the 20% that Medicare doesn't. She told me that my policy did not cover the 20%. Concerned, I called up United Healthcare. Of course I didn't/couldn't speak to the person who sold me this package in the first place but I asked this representative if my policy covered this gap. "No it doesn't." She crisply replied. "Well what policy do you have that would cover that 20%?" I asked. "Oh those policies would cost about $350 a month," she said. At that point I said, "Cancel my insurance as I'm finding something different." I did find a company and a policy that says the premium covers the 20% . I signed up with them in November. The story should end here but it doesn't--not by a long shot. On January 5, 2016 I was checking my account online when I saw that United Healthcare had withdrawn $157.36 from my checking account. The withdrawal was still pending. I called them up and after being on hold for about 40 minutes I talked with a representative and told him that I wanted them to stop that withdrawal right then as I had cancelled my insurance and had already signed up with another firm for that purpose. He forwarded my call to another person. The call failed and I had to start the call process all over again. When I was finally connected with another representative, he told me that they could not stop the withdrawal but they would put the money back into my account and it would be there within 48 hours. It took me over two hours to get that resolution, or what I thought was a resolution. That was Tuesday January 5, 2016. Today, January 12, 2016, I looked at my account online again. The $157.36 was not in my account as promised. I called up United Healthcare and talked to yet a third person from their company regarding this incident. She told me that she couldn't help me but she would forward my call to someone who could. To get to this point took 58 minutes. I told my story once again to the fourth person from United Healthcare. This person put me on hold and went to talk with his supervisors about the incident. About 8 minutes later he came back on the phone and told me that "It is company policy to not return the the funds when a customer cancels until 29 days after they cancel." It hasn't been 29 days since I called to complain about United Healthcare taking money out of my account but it has been more than 29 days since I cancelled as evidenced by the December 9 notification from the letter of acceptance I received from the other health insurance company. You can't just go buy what you need. You have to buy what they are selling--whether it's a healthcare insurance, Internet services, mobile phone services, a car, etc. Products are bundled these days--and not for the consumer's benefit. Products are bundled for the convenience of corporations and profits for their investors. Consumers are the last of their considerations. Consumers most often pay for a lot of things they will never use. They must purchase "a package" in order to purchase the one or two things they want. For example, I would be happy to purchase Internet services only for $30 a month from Time Warner and get an antenna for my television which I watch about twice a month. This would be much more affordable for me than the $85 a month I pay which includes access to TV shows I never watch. Consumers are the bottom of the barrel. 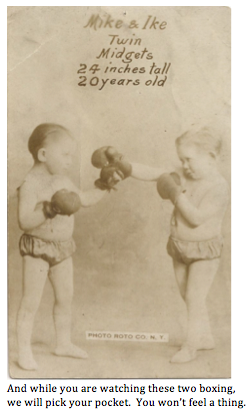 These people take the same attitude the carnies take toward their marks: Buyer Beware. No one is forcing you to buy anything. It's your choice--sure it is. Take it or leave it. Read the fine print. The people we send to Washington are all members of the investor class. They make a lot of money off the carnival. They nickel and dime us while laughing all the way to bank. United Health Care is not in the business of healthcare. Like all so-called "health care" companies, they are a financial institution in the business of making money and lots of it. They have 70 million customers and reported a net income of $8.4 billion in 2015. I am only one person. My $157 they are holding for 29 days might not sound like much, but if you consider the possibility of even 100,000 customers from their pool of 70 million customers in my position, you can see how quickly the nickel and dimes pay off in short-term interest and even long-term interest if they can keep the pot at a consistent level--as one mark leaves another steps up to take that one's place. The people we send to Washington write laws that make it easy for corporate carnies to legally take advantage of us. They do it because these politicians make money off us too. I'm not suggesting these people are doing anything "illegal." And that is precisely my complaint. Much of what they do in the name of "business" should be illegal--and in fact, until the passage of the Bank Modernization Act of 1999 WAS illegal. 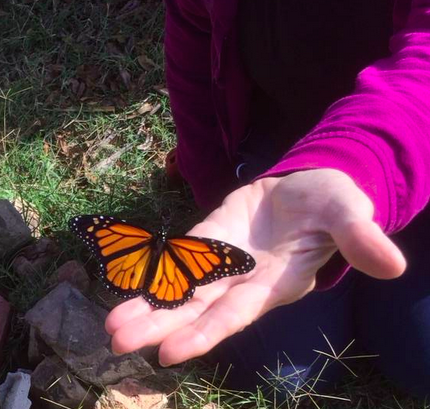 Charlie and I decided the last Monarch Butterfly of 2015 (Happy 2016) deserved better odds for surviving the journey to the Mexican highlands than she would have if we released her in Garland in January. Thus we decided to take her about half-way to Raymondville, Texas where the weather would be a bit more friendly in January. Happy 2016 still had 684.7 miles to go on January 7, 2016 when we released her. Will she make it and join millions of other Monarchs in the oyamel fir tree forests situated in the eastern perimeter of the Mexican state of Michoacan? We don’t know, but considering her luck thus far, I’m betting that she will. To date, she has survived against all odds. 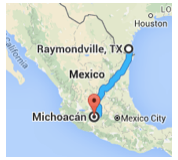 Her flight to Mexico will be made in the daytime, as Monarch butterflies are diurnal—not nocturnal. They remain still at night on bushes and trees. We don’t know for sure how far a Monarch can fly in one day. However, one tagged monarch was recaptured 265 miles away from where it had been released the previous day. (This was the record flight from the Urquhart tagging program. The butterfly was tagged in Waterford, Pennsylvania and recaptured at a site in Virginia.) I predict that Happy 2016 will be with her other Monarch friends no later than Monday January 11, 2016. You can read the complete story of this remarkable Monarch on the home page of Loving Garland Green . org. Why all this fuss over one Butterfly? The Monarch is a flagship species for conservation. Happy 2016 and other Monarch butterflies are lovely symbols to represent all pollinators and call attention to their importance to human beings. Pollinators are responsible for at least 1/3 of all the food we consume and one half of the fats and oils we eat. In addition to that, we use their fibers for our clothing. Populations of the Monarch butterfly (Danaus plexippus) have dropped an astonishing 96.5 percent over the past few decades, from an estimated 1 billion in the mid-1990s to just 35 million in early 2014. Conservation groups have been worrying about this decline for several years It is no surprise that communities are waking up to the importance of pollinators and are taking serious steps to protect them and increase the existence of their habitats. The I-35 corridor from Texas to Minnesota is known as the pollinator highway. A program is now in place and supported by several federal agencies as well as local and state communities along the way to plant 100 miles to either side of this roadway with pollinator-friendly plants including the milkweed in particular. 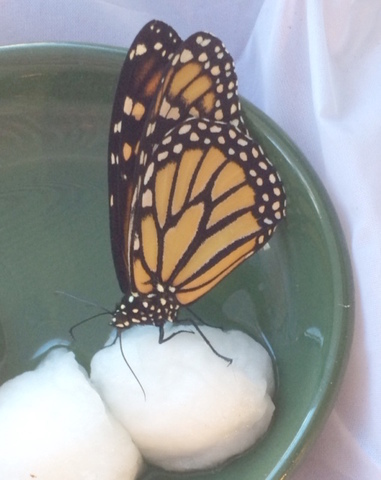 Rescuing Monarchs is a deviation from a natural process. However, what hundreds of people like Charlie and I doing is a temporary intervention to correct and restore a natural process that has already been seriously tampered with and altered--primarily through the overuse of herbicides that have practically eliminated milkweed all along the migration corridors of the Monarch. The milkweed is the only plant that Monarchs and 300 other species of butterflies (called "the milkweed butterflies") will deposit their eggs on. Due to the indiscriminate use of both pesticides and herbicides, the Monarch population as well as the population of many of our other pollinators is dangerously threatened. It is estimated that less than 5% of Monarchs 14 are able to complete their lifecycle. Most die as eggs or caterpillars. Monarchs that are rescued have a 95% probability of survival to adulthood. Plant a few milkweed plants in your yard this spring. Encourage your mayor to take the National Wildlife Federation’s Mayors’ Monarch Pledge. Through the National Wildlife Federation’s Mayors' Monarch Pledge, cities and municipalities are committing to create habitat and educate citizens about how they can make a difference at home. Happy 2016 became a monarch sometime during the day of December 31, 2015. 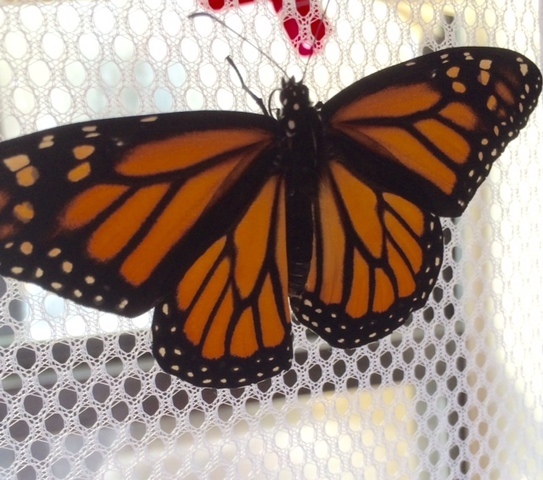 We are fairly certain this female monarch is the last monarch from 2015 to leave Garland, if not Texas. She was found in the Garland Community Garden on December 5, 2015. At that time she was a fat caterpillar clinging to a dry withered milkweed leaf. Members of Loving Garland Green rescued the caterpillar and nourished it to the pupa stage. We had originally thought the caterpillar would eclose on Christmas day, but it appears she had plans to be a New Year's baby as she emerged on New Year's Eve. On Wednesday of this week we will drive her a few hundred miles to south central Texas and release her in a nature park. Frankly I had given up on the pupa and was shocked when I saw her flying about the monarch condo. The first challenge was to find some food for her. I quickly made some sugar water, soaked some cotton balls in it and placed in the condo. She drank and drank and drank. Yesterday I discovered a marigold blooming over at Charlie's. I put it in her condo. She's been working on that for quite a while now. Tonight we picked up some watermelon for her. Butterflies are not limited to flower nectar. They will eat/drink just about anything that is water soluble and sweet. Providing that all things go well, Charlie and I will be driving her several hundred miles south on Wednesday. We will release her on Thursday in a nature park in Nueces County. The last of the Monarchs from Garland, Texas.